Happy Sweet 16 Tess Grubbins! So here’s the real puzzle – no family members may participate – what year was it and how old is Katy now!? The cake and frosting were very easy the chocolate collar wasn’t. This was my first time trying one out and it didn’t go too bad, but it was far from smooth sailing. add dry ingredients to liquid ingredients and stir until smooth. Makes 4# 10oz (about 9 Cups of Batter) – portion out 3 cups per layer or weigh them out (1# 8oz per pan) to be even. Bake at 350 for 40-55 minutes or until toothpick inserted in center comes out clean. Cool completely, wrap in Saran and freeze until ready to frost – I store mine in the pan when I freeze them so they don’t get damaged. Beat Butter and Cream Cheese on high until fluffy. Slowly add powdered sugar then mix in Kahlua. Put a crumb coating of frosting on the cake – it doesn’t need to be fancy – that part comes later. 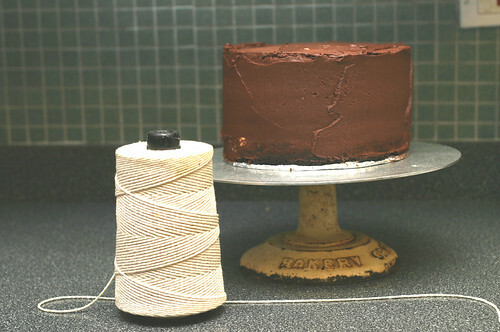 Measure the circumfrence of the cake with some string. Cut the string an inch or so extra for an overlap. 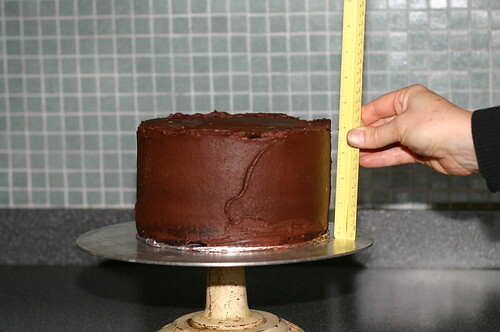 Measure the height of the cake with a ruler. This is where I’m chalking up to my first timers niavite`. 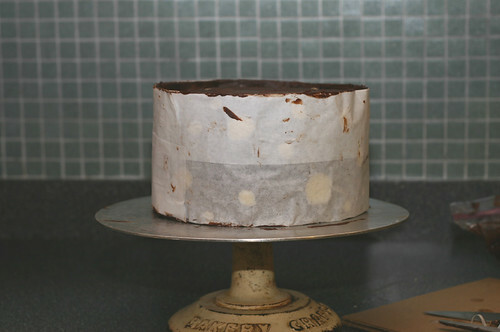 I should have gone to a craft store and purchased some acetate (flimsy plastic) instead I used parchment paper – after the fact – I realized acetate would have been much sturdier and wouldn’t show all the folds in the chocolate like the parchment did – next time. 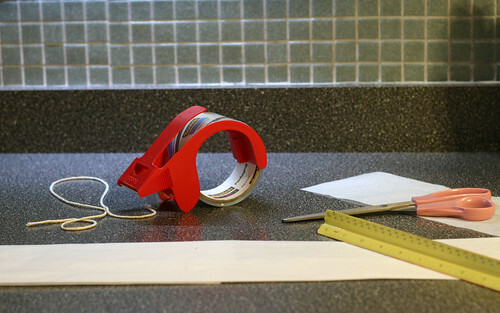 So measure the acetate with measurements you got with the string and ruler – cut to size. update: I found acetate or mylar at an art store – it comes in different thickness’. 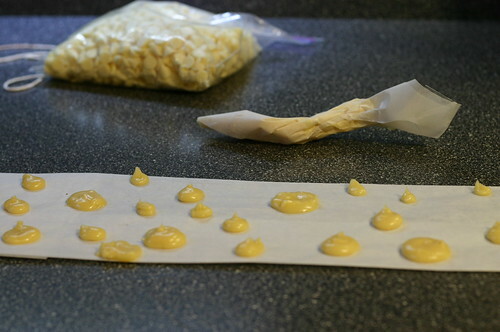 Melt some white chocolate and pipe on your design or dots. Let this harden completely before next step. 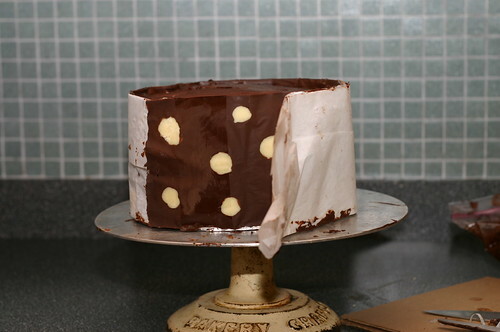 Melt your chocolate – I used 2 1/2 cups for this cake. 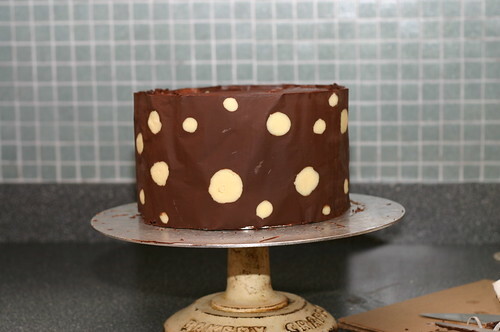 Spread on top of dots – make sure your chocolate isn’t so hot that it melts the dots. 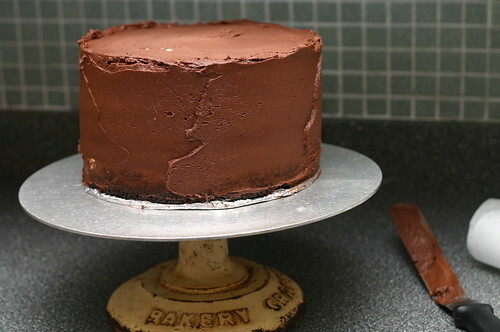 Let the chocolate set slightly before adhering it to the cake. Let chocolate harden completely before removing its protection. 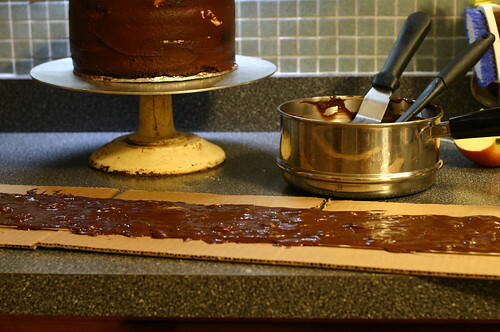 There you go – pipe extra frosting on top and tie a bow around if you’d like. All I can is WOW! This cake SOUNDS delicious. AND, this cake LOOKS delicious! 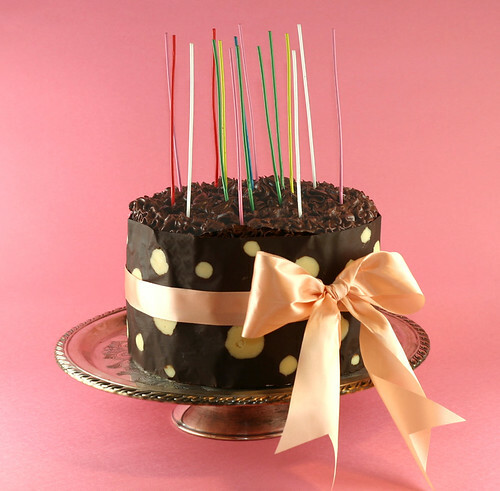 LOVE the idea of wrapping the cake in chocolate. Mmmmmm….soooo good! It’s great to have instructions on how to make the collar. It always looked too fabulous to really be do-able. Now I know how, and I’ll have to give it a go sometime. So, Tess, how was the cake?! This cake looks and sounds so freaking delicious! ABsolutely gorgeous and delicious sounding! Looks DELICIOUS! I’m making this. A Beauty! And I also love that cake stand!!! oh I wish I had one just like that. So well done a cake. chocolate is my favourite food. I have a hard time resisting buying a bar everytime I go out to the shops. WOW Oh WOW!!!! This is a fabulous looking cake and a first try, I’m impressed friend. Superb job. What a beautiful cake and a great tutorial! That’s a very gorgeous cake. Great tutorial too. wow, i really thot it was a real wrapping paper all along until i finished reading the whole recipe! Holey. Crap. That looks good. And I learned something to boot! What a beautiful birthday cake! I hope it was well liked and eaten. I always like to add a little kahlua or espresso to chocolate cakes to amp up the flavor but 2 cups? With Sour cream and Cream Cheese? Decadent. Heavenly. This is a keeper recipe with or without the collar but loved learning about how to do it. I am coveting your cake stand! Where ever did you find that!?! its a beautiful cake! i wish i had the confidence to try that! ha ha … i have seen the type where you put pirouette cookies all around it, put a bow on it to make it look pretty … that sounds way easier to me! good job! Wow, Mary. Another cake where you’ve out- done yourself! I really think cakes are your specialty. I’m sure Tess LOVED it! Wow! I love the decorations on the outside!! Great cake – Kori told me its the best cake she’s ever had. She can’t get over the fact that its so chocolaty, but isn’t so rich that you’re done for. You can even have a second piece. Sam & I had to finish it off. It was our duty. Oh, really, Mr. Winker? XD Was it your civic duty to finish it? Was it against the law not to? Would the world end if you didn’t? XD Just kidding, all of those are obviously true. I just made this cake for a 50th birthday dinner party tomorrow night. The collar turned out great! I couldn’t find acetate, so I pieced together two very flimsy, plastic cutting boards and used those. It is BEAUTIFUL! Thanks, Mary, for the great instructions. I’ll be sure to let you know how the guests like it. I’ll also post the rest of the menu items on Foodo. So far, so impressed! They JUST HAD to know how the heck I made that cake. They thought it was from Woullette’s Bakery. Ah, I love to impress the gay men! I’m one of the recipients of that cake, and I have to say, it was absolutely amazing! Thank you so much for inviting me to your birthday party, Tess! p.s. Hey, Tess, this would be a great cake to use to bribe people that we’re the right people to rule the world! XD Just kidding, of course. I must tell you, I made this cake last year for Cinco de Mayo and I’d had the leftover frosting in my freezer ever since then. A bit odd, yes, but the extra kahlua I’d added kept it okay. I’ve covered frozen bananas with it, drizzled it over poached pears, every thing I did was awesome. I finally used the last of it this morning for a final cake for work, which my coworkers adore. Thank you for the recipe, it’s the best frosting I’ve ever had and the cake was wonderful too.